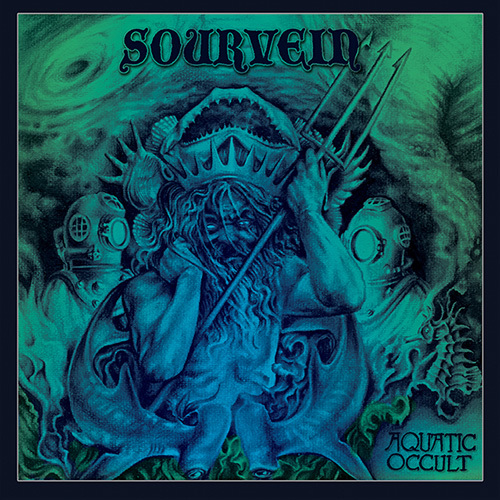 Last month, it was announced that decade-spanning doom/sludge metal vets Sourvein would be back with their long-awaited Metal Blade Records debut, Aquatic Occult. Featuring guest performances by Lamb of God‘s Randy Blythe (vocals, organ), Amebix‘s Stig Miller (guitar), Corrosion of Conformity‘s Reed Mullin (drums) and many others, the album is described by frontman T-Roy as the record he wanted to make at a time when his life was at its bleakest. “Aquanaut” also features some friends of T-Roy’s – performing lead guitar on the track is Dean Berry, formerly of English sludge metal vets Iron Monkey. In addition, Chris Holcombe and Joel Martin of sludge metal outfit Subrig Destroyer provide drums and additional rhythm guitar, respectively. They join Sourvein mainstays Kevin Rochelle (Sea of Tyrants) on guitar, Lou Gorra on bass, and of course, T-Roy on vocals.